 Edward H. Stanford (clerk): William M. Stanford (clerk). James Finnegan (police captain); Mary A. Johnson. Charles J. Stoddard (Pension Office). Ida Bitz (bookbinder); James L. Stoddard (clerk). Newton B. Wade (Department of Agriculture). Charles F. Brown (Interstate Commerce); Jesse Gall (Bureau of Printing). Cabell H. Adams (contractor); Milton D. Harvey (clerk); Patrick Malone (police). Patrick J. Malone (Capitol Police). Annie E. Boarman (clerk, Department of Agriculture); Rowland Williamson (Library of Congress). Wallace E. Mattingly (inspector); Rowland Williamson (Library of Congress). (304a) John M. Brown. (304b) Jerry T. Donnell. (304a) No return. (304b) Jerry T. Donnell. Phoebe Lowe; John B. Taylor (whitewasher). Mercelener Jordon [sic: Jordan?] (lady’s nurse, widow of Fleming Jordon); Thomas W. Jordon. William H. Marshall (laborer); Phebe Lowe; William Countee (laborer). William Sweeting (laborer); Jane Garrett (widow of David Garrett). Phebe Lowe (widow of Jerry Lowe); Susan Tyler (widow of John Tyler). Marcelena Jordan (widow of Flemming [sic] Jordan; Jane Garrett (widow of David Garrett). Jane Garrett (widow of David Garrett). Jane Garrett (midwife, widow of David Garrett); Charity Washington (servant). Silas Washington (driver); Charity Washington (nurse); Jane Garrett (nurse, widow of David Garrett). Susan Tyler (servant); Mary Kirkland. Jane Garrett (widow of David Garrett); Mary E. Kirkland. William Allis (shoemaker); Peter Edelin (shoemaker); Sophia Mitchell (domestic). Genevieve T. Yager (widow of Francis T. Yager); Gertrude W. Ashby (clerk, Dead Letter Office). Genevieve T. Yager (widow of Francis T. Yager); Llewellyn M. Cook (L. M. Cook & Co.); Gertrude W. Ashby (clerk, Dead Letter Office). Gertrude W. Ashby (clerk, Dead Letter Office); Llewellyn M. Cook (L. M. Cook & Co.); Genevieve T. Yager (widow of Frank W. [sic] Yager). Lucy J. Dorsey; Gertrude W. Ashby (clerk, Dead Letter Office). Addie S. Hillyer; Rev. Charles H. Hayes (assistant rector, St. Mark’s Church). Rev. William L. Devries (rector, St. Mark’s Church); Rev. E. Magruder Thompson; Rev. Charles H. Hayes (assistant rector, St. Mark’s Church); Addie S. Hillyer; Cora Johnson (domestic). J. Arthur Russell (clerk); Charles E. Chambliss (Department of Agriculture); Sarah Clase (clerk). Annie H. Gibson (widow); Henry Ittig (clerk, Navy); B. L. Williams (clerk, Patent Office). Alfred F. W. Schmidt (Library of Congress); Anna H. Gibson. H. P. Andrews (clerk, Capitol); Anne H. Gibson (widow); Oscar M. Pond (Census Office); Mary A. Matthews (Library of Congress); William C. Hodgkins (surveyor). William J. Wallis (teacher); John D. Wolcott (Library of Congress); H. P. Andrews (clerk, Capitol); William J. Wallis (teacher). J. Randolph Tucker (clerk, Library of Congress); Lawrence Washington (Library of Congress); Louisa F. Washington (stenographer); Pattie W. Washington; Fannie J. Washington; Willis L. Washington. J. Randolph Tucker (Library of Congress); Lawrence Washington (Library of Congress); Louisa F. Washington (stenographer); Pattie W. Washington (clerk); Willis L. Washington. George Turner (clerk); Charles J. Turner (salesman). Lem J. Embrey (watchman); Lena E. Embrey; Thad J. Embrey (clerk). Lee J. Embrey (watchman); Thaddeus J. Embrey (student, boards). Chester L. Ballard (mariner); Guy C. Ballard (mariner); Ida M. Ballard (widow of Chester L. Ballard [sic]); Leo C. Lewis (chauffeur); Jerome Scarborough (police captain). J. Randolph Grove (machinist); Florence Van Cott (stenographer); Joseph J. Brown (machinist). Aubrey Simmons (machinist); John A. Simmons (Navy Yard); Maude Douglas (clerk). Fannie M. Carpenter (widow of Fred Carpenter). Howard B. Abbott (clerk); L. S. Abbott (clerk, Treasury Department); Carlos Hickenlopper (clerk); George Hickenlopper (clerk). S. A. H. McKim (physician; business and home address). Richard Granger (messenger, House of Representatives post office). William E. Stearns (clerk, Patent Office). Charles H. Flemer (carpenter); Charles H. Flemer (clerk). E. A. Doughty (clerk, Treasury Department); Eva A. Doughty (clerk, Fourth Comptroller’s office); James E. Doughty (lawyer); Charles H. Flemer (carpenter); Lewis Flemer (clerk); Eunice Rider (widow of James Rider). Adolph Flemmer [sic] (civil engineer); Charles H. Flemmer; Lewis Flemmer (clerk). Adolph Flemmer [sic] (civil engineer); Andrew Flemmer (clerk): Charles H. Flemmer; Lewis Flemmer (clerk); Evelina A. Doughty (clerk, Treasury Department). Adolph Flemer (civil engineer); Andrew Flemer (clerk); Eva Doughty (clerk, Treasury Department). Henry S. Town (messenger); Mary L. Town (clerk, Post Office Department); Eva Doughty (clerk, Fourth Auditor’s office). Eve Doughty (clerk, Treasury Department). Eva Doughty (clerk, Fourth Auditor’s office). William H. Martin (House of Representatives, Texas); Moses D. Baker (contracting paper-hanger); John C. Henderson (paper-hanger); Julia A. Brown (teacher). William H. Harder (printer); Will N. Harder; Julia A. Brown (teacher); Moses D. Baker (contracting paper-hanger); Caleb Taylor (waiter). Moses D. Baker (contracting paper-hanger); Julia A. Brown (teacher); William N. Harder (clerk, Pension Office); Mary L. Packard (teacher). Moses D. Baker (paper-hanger); James H. Morrison (machinist). Lewis Flemer (Mackall Brothers & Flemer). Charles H. Flemer; Lewis Flemer (Mackall Brothers & Flemer); Sarah Johnson (domestic). Annie B. Woolfolk (domestic); Charles Flemer; John A. Flemer (assistant, Coast and Geodetic Survey); Lewis Flemer (Mackall Brothers & Flemer); Sarah Johnson (domestic). Melville G. Green (clerk, Navy Yard). Mary F. Baker (sexton); Moses D. Baker (sexton). Moses D. Baker (sexton); Charles Poindexter (plumber). Clara B. Smith (widow of Arthur W. Smith). 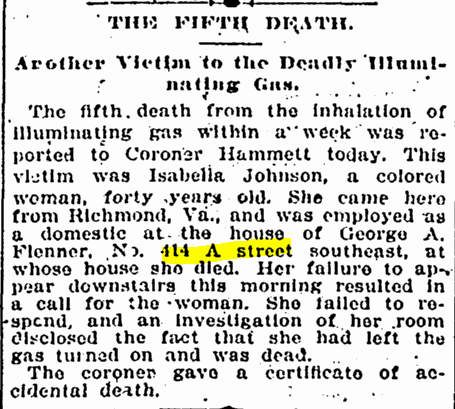 Washington Evening Star, 8 January 1895, p. 2. Federal census, 1940, 505 A St., S.E., Washington, D.C.
Sam P. McGill (owns, property $7,000), head, 42, married, completed high school, born in Ark., lived in Bentonville, Ark., in 1935, clerk, U.S. House Office Building, worked 52 weeks in 1939, income $2,000. Helen J. McGill, wife, 34, married, competed high school, born in Ark., lived in Bentonville, Ark., in 1935, saleswoman, retail department store, worked 52 weeks in 1939, income $900. Betty L. McGill, daughter, 14, completed 1 year of high school, born in Okla., lived in Bentonville, Ark., in 1935. Mary J. McGill, daughter, 12, completed 7th grade, born in Okla., lived in Bentonville, Ark., in 1935. Roy L. Sanker, lodger, 28, single, completed 2 years of college, born in Penn., lived in same place in 1935, attendant, [illegible word] U.S. House Office Building, worked 52 weeks in 1939, income $1,560. Joseph J. Sanker, lodger, 31, single, completed high school, born in Penn., lived in same place in 1935, elevator operator, U.S. House Office Building, worked 26 weeks in 1939, income $500. John W. Croome, lodger, 26, single, completed 3 years of college, born in D.C., lived in same place in 1935, elevator operator, U.S. House Office Building, worked 52 weeks in 1939, income $1,260. Alfred M. Johnson (rents, $30), head, 27, married, completed 1 year of college, born in Ark., lived in Fayetteville, Ark., in 1935, clerk, U.S. government, worked 52 weeks in 1939, income $1,640. Mary E. Johnson, wife, 24, married, completed high school, born in Miss., lived in Fayetteville, Ark., in 1935, not employed. Marilyn J. Johnson, daughter, 2, born in Ark.